"...has already crossed a crucial threshold: the city and surrounding county, with a population of 80,000, essentially use no oil, natural gas or coal to heat homes and businesses, even during the long frigid winters. It is a complete reversal from 20 years ago, when all of their heat came from fossil fuels. [...] as befits a region that is an epicenter of farming and food processing, it generates energy from a motley assortment of ingredients like potato peels, manure, used cooking oil, stale cookies and pig intestines. A hulking 10-year-old plant on the outskirts of Kristianstad uses a biological process to transform the detritus into biogas, a form of methane. That gas is burned to create heat and electricity, or is refined as a fuel for cars. 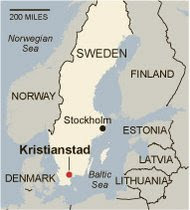 Once the city fathers got into the habit of harnessing power locally, they saw fuel everywhere: Kristianstad also burns gas emanating from an old landfill and sewage ponds, as well as wood waste from flooring factories and tree prunings." Interesting how generalizable this can be. See also slideshow.